This post is my contribution to Gayla's “Seven things (plus some extra fun things at the end)” meme. 1) Leaf colours -- Not only does the foliage change gradually from green to pale yellow to apricot throughout October but on a on mid-autumn day, a single leaf can be variegated with all these hues plus tinged with a rose-to-plum blush. 2) Sunlight filtered through translucent leaves -- Prettiest in the morning, especially after a rain shower in late September and viewed from the under-side. 3) Orange hearts fluttering against a blue sky -- Blue and orange is my favourite, complementary colour scheme. It boosts my energy and my spirits. 4) A golden glow -- I captured this image last year in late October on a rare, sunny day. Today, on this more typical West Coast rainy, gray fall day, I'm wondering if I can use it for phototherapy. 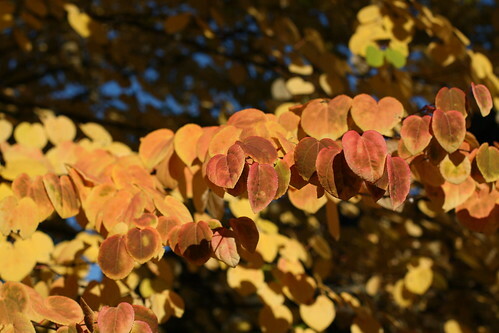 5) Foliage and habit -- Though they aren't just autumn features, at this time of year I especially notice the heart-shaped leaves, the gracefully arching limbs, and the elegant shape katsura maintains from youth to maturity. 6) Tradition -- Every Thanksgiving, I photograph the tree in my Mom's yard. The photo below is from this year; the one at the beginning of this post is from 2007. When the fates conspire and the colours emerge, katsuras are like fireballs: all saturated red, pink, orange and blackening maroon, like a simmering furnace of molten metals and slag. 7) Tend the Earth, Mend the Spirit, Stretch & Strengthen the Body -- A favourite book's title and missing Pilates classes during my vacation inspired this reason. Perhaps if I had to rake leaves from more than one medium-sized katsura I wouldn't find "tending" consistently pleasant, let alone therapeutic, but I truly enjoyed the daily leaf-raking ritual while I was visiting my mom for two weeks. It was good for my mind and spirit as I practiced being in the present moment (inhale/rake, exhale/rake, focus on the task at hand, "all will be well"). It was good for my body, as I applied (correctly, I hope) various Pilates' principles to bending, stretching and lifting.